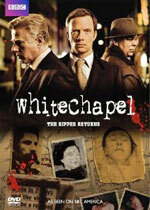 Whitechapel: Mystery and Suspense on Television. In modern London, the detectives of the Whitechapel district must, in the first season, deal with a series of copycat historical crimes in this British crime drama. Later seasons expand the scope of the team's investigations. The series stars Rupert Penry-Jones as Detective Inspector Joseph Chandler, Phil Davis as DS Ray Miles, and Edward Buchan as an authority on historical crimes. Note: The Season 1 DVD includes only the first three episodes of the series that originally aired on BBC. Later episodes aired on ITV, which canceled the series after four seasons.